The Governor of Helmand Province in Afghanistan, Gulabuddin Mangal, today made a visit to the National Memorial Arboretum in Staffordshire. During the visit he met Lucy Aldridge, mother of Rifleman William Aldridge. William, of 2 Rifles, is the youngest member of UK Armed Forces to be killed in Afghanistan. 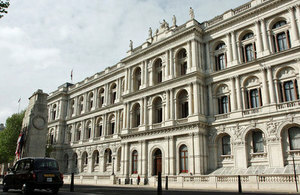 Governor Mangal is in the UK to meet and brief Ministers and other MPs on the current situation in Helmand. During the visit, the Governor revealed that the tour of the Arboretum, and its striking Armed Forces Memorial, was inspired by conversations with soldiers he has met recently in Helmand. William Aldridge was killed by an IED blast in Sangin, Helmand, in July 2009 while helping to extract casualties from a previous explosion in which he too had been injured. In private conversations with Lucy Aldridge, he talked of her son’s bravery and expressed his sincere condolences for both her loss and for the losses experienced by so many other families. Governor Mangal said: “I want to pay tribute to William’s mother and, as a father myself, share the pain she has experienced. It was an honour to speak to Lucy and talk about her incredibly brave son. During the Governor’s tour of the 150-acre National Memorial Arboretum he laid a wreath in Remembrance of the members of the UK Armed Forces who are commemorated on the Armed Forces Memorial.